An IRA flying column c. 1921. In the first of a three part series, John Dorney looks at how ‘ the gun re-entered Irish politics’ and how they were used. The series of conflicts we now call the Irish Revolution raged from 1916 to 1923. They included a number of discrete episodes with different combatants arrayed against each other in each. The period was a political as much as military contest but it did see 4-5,000 people lose their lives in armed conflict. Partisan debate raged at the time about whether the ‘Trouble’ amounted to political violence or warfare. The point has been made that it was not so much the quantity or quality of weapons that caused deaths and injuries as the willingness to use them. Pistols in the hands of determined gunmen could be responsible for many more deaths than a heavily armed military unit with rifles and machine guns. One could instance Bloody Sunday in 1920 in which IRA Squad and Dublin Brigade assassins killed 14 British officers in one morning (mostly in their beds) without any combat taking place. The same was true for the shooting of informers which accounted for 180 or so IRA victims in 1919-1921. Historians such as Peter Hart argued that rifles were above all of symbolic importance to the Volunteers of the IRA – a sign that they real soldiers and, he argued, real men. The real killing was done by clandestine operatives with concealed weapons. He made the point that both Irish factions in the Civil War of 1922-23 were considerably better armed than the IRA had been against the British but that casualties were not noticeably higher. No one should doubt the symbolic importance of rifles to young Volunteers. In 1914 the Irish Republicans Brotherhood organ Irish Freedom wrote, ‘A dozen rifles are more effective than a thousand resolutions in Parliament’. If rifles were merely symbolic of the IRA’s view of itself as an army and the real killing was done by assassination, then weapons and combat are not important in the study of the Irish revolution. But this argument has its limits. It has been suggested that military combat was rare and therefore weaponry was irrelevant to the Irish revolution. Combat was not as infrequent as Hart made out. D.M. Leeson concluded that, ‘killing unarmed helpless men was more common than battle – but not that much more common: and what is more, most of those unarmed and helpless victims were killed by the police [in reprisals]’. The argument that combat was irrelevant, aside from its partisan implications (the IRA were cowardly ‘gunmen’ not soldiers) misses a number of important points. First, open warfare, which involved sustained fighting and the use of heavy weapons, caused far higher casualties than clandestine political violence when it did occur – the insurrection of 1916 and the opening month of the Civil War in 1922 (respectively 487 dead in the 5 days of the 1916 Rising and by my count, about 350 in July/August 1922). Secondly the body count was not the only way to measure military effectiveness. Well-armed troops or militias could cow worse-armed opponents, arrest them and cause them to flee for the hills, meaning that that side now administered an area. Clandestine assassination did not change this balance. Weapons and how they were used did matter. In actual combat, a revolver could not take on a rifle except at very close range, rifles could not take on light machine guns, especially if they were mounted in armoured vehicles and no small arms could stand up to artillery in open warfare. Well-armed and motivated guerrillas could make it impossible for regular troops to patrol an area except in great force and prevent them from establishing posts except in considerable strength. Had they had mortars and light artillery (they never did) virtually all small rural police and military posts could have been made untenable. In short; weapons and how they were used did matter. 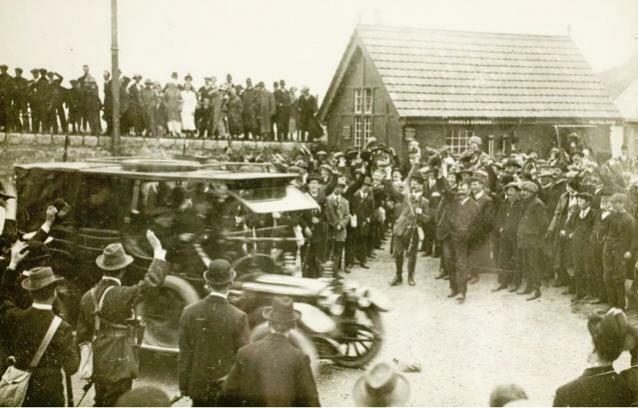 The UVF parade armed at Larne. In the Ulster crisis of 1913-14, both rival Volunteer movements, Ulster and Irish armed themselves with an assortment of weapons from around Europe. The Irish Volunteers for their part unloaded at Howth harbour from the yacht the Asgard, a cargo of 900 rifles and 30,000 rounds of ammunition that Bulmer Hobson, the IRB leader, had secretly purchased in Germany and another 600 at Kilcoole, County Wicklow later in the summer of 1914. These arsenals were both much less impressive than they looked on paper. The unionists imported better rifles than the nationalists but they were of three different types, German Mausers (1888 model), Austrian Steyr Manlicher rifles and Italian Vetterli rifles. All of these took a different calibre bullet so supply of ammunition to fighters would have been very difficult in the event of their being fired in anger. Some of them were also old and in poor condition and in fact they were never used in action. 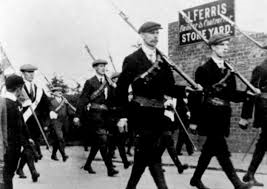 Many of the Ulster Volunteers went off to war with the British Army in 1914. When conflict did come to Ulster in earnest in mid 1920, the British authorities collected most unionist arms to prevent the IRA getting them, though they effectively re-armed the loyalist militias in the newly formed Ulster Special Constabulary with standard British military small arms. The Volunteers take the newly imported rifles away from Howth pier. As it was though, the symbolic and propaganda effect of the UVF’s arms was highly effective. In the face of the prospect of armed unionist resistance, the British government backed down and in 1914 excluded 6 counties of Ulster from Home Rule – a status that was later confirmed in mid 1920. As for the Irish Volunteers, they suffered a split in 1914 (the National Volunteers followed Irish Party leader John Redmond into support for Britain in the First World War) and as result lost some of the ‘Howth Mausers’. In practice as the war went on the National Volunteers’ enthusiasm waned, the core IRB-influenced group of the Irish Volunteers regained some of these weapons. They had, however, other problems with armament. The 1871 ‘ Howth Mauser’. The 1871 or ‘Howth’ Mauser was a very long, very heavy, very old, single shot weapon. 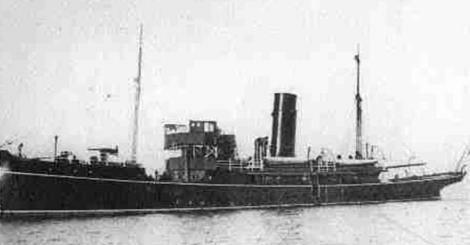 It was relatively slow to reload, its ammunition (11mm) was scarce and could not be resupplied in Ireland. It was also black powder, creating a ferocious explosion and a cloud of black smoke when fired, thus giving away the position of the firer. In the words of one Volunteer who ended up using it in the 1916 Rising, ‘it was a bad weapon for street fighting’; ‘Flame about three foot long came out through the barrel when it was fired and a shower of soot and smoke came back in one’s face. After three shots were fired from it, it would have to be thrown away to let it cool and the concussion of it was so severe that it drove me back along the floor several feet’. Volunteers in the GPO with a motley collection of arms. On the other hand, the heavy lead bullet fired by the ‘Howth Mauser’, broke up on impact with human bodies, caused terrible exit wounds, and inspired significant fear among those on the receiving end. They could also punch through sandbags and walls as British troops trying to set up a machine gun post as Digges Street near Jacob’s Factory found; according to Peadar Kearney ‘they were literally blown out of it. A dozen Howth Mausers could always do that’. The majority of Volunteers in 1916 carried the obsolete ‘Howth Mauser’ but those that could the much superior Lee Enfield issued to British troops. 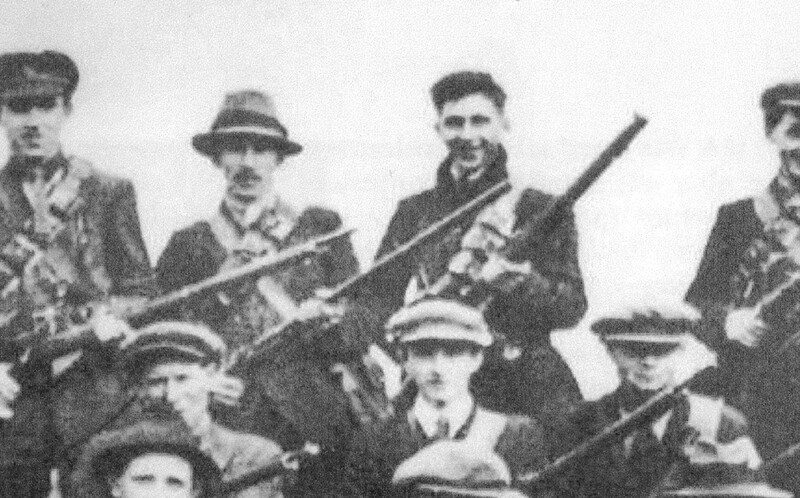 It seems that the majority of Volunteer and Citizen Army fighters were armed with the Howth Mauser. Although there were also a certain amount of Italian Vetterli Rifles in the hands of the Volunteeers and Citizen Army dating from early 1914, when they had been imported during the Ulster crisis, ammunition for them was scarce and it is not clear if they were used in the Rising. A much better bet for the Volunteers, where they could get them, were the British Lee Enfield .303 rifles. Apart from being newer, significantly shorter and lighter than the 1871 Mauser, the Lee Enfield held a magazine of ten rounds and by manipulation of the bolt action, could be fired rapidly in trained hands (perhaps 20-30 shots per minute for veteran troops). It also used smokeless powder and so did not give away the firer’s position. 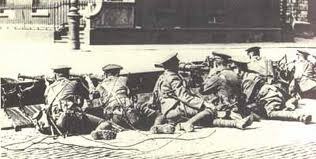 British troops with Lee Enfield rifles and a Lewis gun in Dublin in 1916. The Volunteers borrowed, bought and stole Lee Enfields wherever they could in the months leading up the Rising. So many service rifles began to go missing in the months leading up to the Rising – mostly sold off by British ‘Tommies’ at Dublin port – that troops embarking at Hollyhead for Dublin were instructed to leave their rifles behind in Wales and pick up new ones at barracks in Dublin. The C96 Mauser pistol or ‘Peter the Painter’. One surprisingly effective weapon in the hands of the Volunteers was what they referred to as the ‘Peter the Painter’ (after an anarchist terrorist who used one in turn-of-the-century London) or C96 Mauser automatic pistol. This was a clip fed semi-automatic weapon that held ten 7.63 rounds. It could be equipped with a shoulder stock to make it more accurate and proved lethally effective in close quarters street fighting during Easter Week. At Mount Street Bridge Mick Malone , armed with a C96 and accompanied by a mere 12 Volunteers killed and wounded 240 Sherwood Foresters. Malone himself in one charge shot down ten British soldiers with his automatic pistol before taking up a Howth Mauser. Other Volunteers carried revolvers, shotguns or even pikes, the latter being virtually useless in a 20th century fire fight. 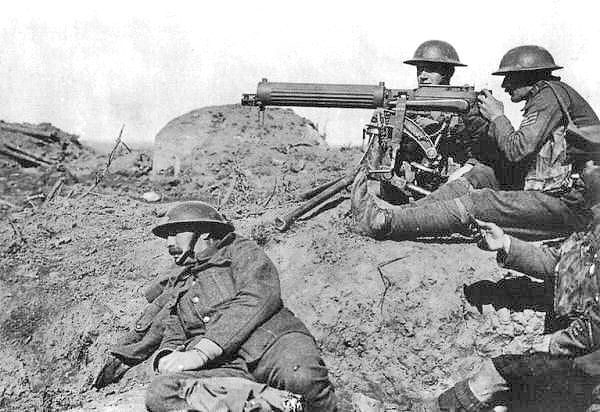 Vickers machine gun being used by British troops in the First World War. Having occupied positions around Dublin on Easter Monday, many Volunteers actually saw little combat until they received the order to surrender. But those that were attacked in their fortified positions in general proved very difficult to dislodge despite their antiquated weapons. By the end of the week, the only insurgent stronghold that had actually been forced to surrender was the rebel headquarters at the GPO. The British forces massively outnumbered and outgunned the insurgents in 1916. By the end of the week they had assembled some 16,000 troops to take on the 1,600 odd rebels. Every infantryman was equipped with a Lee Enfield rifle, which in most cases was superior to what they faced. The decisive weapons in the 1916 Rising were heavy machine guns and artillery. More important though, were machine guns, of which the British had many and the Volunteers none. The Vickers heavy machine gun was belt fed and could fire continuously at a rate of 500 rounds per minute. The Lewis light machine gun was fed by a 47 round pan magazine and could be carried around easily by infantry troops, unlike the Vickers. Both, but especially the former, could ‘suppress’ a defensive position by spraying it with so many bullets that no one would be able to return fire. Automatic weapons made a significant difference but the decisive weapon in 1916 was artillery. The British Army after the initial shock of the outbreak of the rebellion, deployed four 18 pounder field guns in Dublin, taken from the garrison in Athlone along with a 12 pounder gun aboard the gun-boat Helga. A number of insurgent positions were fired at with artillery, but it made the most difference at the rebel headquarters at the GPO and O’Connell Street, where artillery fire by the Friday had made the Post Office a flaming inferno and levelled much of Dublin’s main street. This was the main factor in the insurgent surrender. It also seems likely that the use of heavy weapons in a densely populated urban area caused many of the 250 odd civilian fatalities. The disproportion in the weaponry available to both sides was a salutary lesson to the surviving Volunteers, notably Michael Collins, who resolved never to gain face the British military in open combat. Watch out for part 2, Weapons of the Irish War of Independence. Robert Holland, quoted in Fearghal McGarry, The Rising, Ireland Easter 1916, p175. Charles Townshend Easter 1916 p201. Written by: John_Dorney on 9 May, 2015.on 5 July, 2015. 9 Responses to "Weapons of the Irish Revolution – part I 1914-16"
Look forward to reading your book. Dad was a part of the “troubles: from the age of 12 and imprisoned from Aug 1922 to Dec 1923 . Thanks very much Mary. ‘Peace After the Final Battle’ has been out since last May. I’m working now on a new one specifically about the Civil War in Dublin. Reading through lots of reports of prisoners taken etc. Where was your Dad picked up? Thoroughly enjoyed reading your article. Three points that you may want to double-check, though. By the Easter Rising, the RIC was armed with the .303 six-shot P1905 RIC carbine– they had long turned in their Martinis by this time. 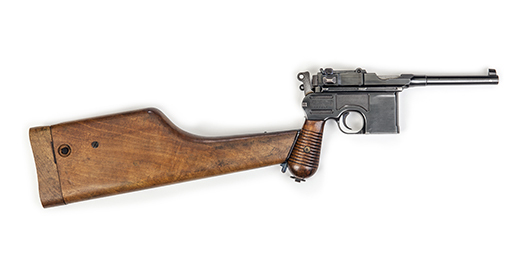 Most of the C96 pistols were in 7.63mm Mauser, while some may have been chambered in 9mm. Finally, the Malone at Mount Street Bridge was Michael “Mick” Malone– not Tom. Thanks for the corrections. I don’t know why I wrote Tom, it was of course, Mick Malone! But re the Martinis and the RIC, are you sure? I’ll have to check up on that one. Will be glad to furnish you with more info and photos of actual arms. Can we get off this public site, and correspond via email? My grandpa Tommy from Donegal worked In Scotland 1901-1916 In 1916 newly married a member of IRB worked a large Pub Greenock Scotland were he was buying guns for the Rising. But had to leave because he was about to be arrested, he left Scotland not telling his wife on boat back to Inishowen. The IRB told my grandma to leave everything and get on the next boat back to Moville. This would be the first of three times they would come for him, on the run, the next time Black and Tan came for him in 1920s. Third time the Free Staters came for him 1922-23, hiding with a gun, luckily Free Staters did not come upstairs.